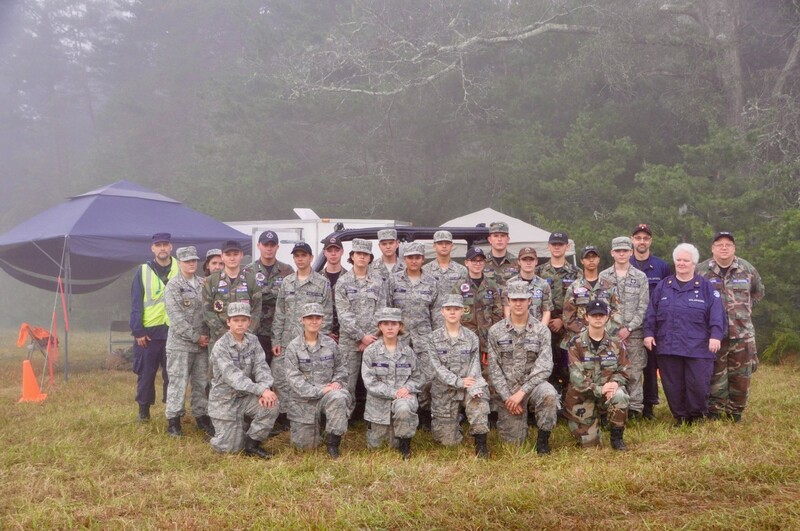 On 2 Dec 2018, 27 Civil Air Patrol (CAP) members from five squadrons across the Wing reported to the North Carolina Wing Headquarters in Burlington as part of the graduation exercise for the Fundamentals of Emergency Services Training (FEST). 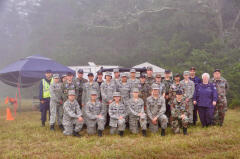 The multi-phase training program based on the Alabama Wing's Emergency Services School or WESS, was originally started by Lt Col and CAP Director of Operations John Desmarais and Lt Col Michael Long in 1997 and the North Carolina Wing is implementing proven concepts into a viable training opportunity for the Wing. FEST phase one began in mid-October and included First Aid, ICUT, land survival and intro to shelter building. Phase two was held 26-28 October and included land navigation, pace count, hasty search techniques, line search techniques, learning knots and other rope work necessary for wilderness and search and rescue situations, as well as a land navigation practical exercise. The third phase took place on 2-4 November 2018 and consisted of direction-finding training as well as an emergency locator beacon training. The final phase, 30 Nov-2 Dec, was to be a weekend of scenario based practicals to bring all the skills learned together. While the weather was not conducive for air operations for the final graduation exercise portion, a North Carolina Highway Patrol helicopter was ready to provide aerial support for a missing persons search. This was partially offset with the addition of Jet the search dog and her handler Audrey Low of the Wake Canine division. Jet made quick work of locating the missing persons and was a big hit with all those involved. The NC Land Search Field Team Member (NC8100) training was offered as a part of the school and produced four newly qualified members with the qualifications desired by the State of North Carolina. This is a 200% increase for CAP members for this new program. There were also six newly qualified GTM 3 and nine newly qualified GTM 1 personnel. Assistant Activity Director SM Casey Carnes said, “This type of training insures that our members are well trained in all phases and requires that every participant do every task to be signed off. This is a 100% activity which means that the participant must show proficiency at each and every task." A special note of thanks goes out to Lt Col Chris Bailey and to Capt Ben Watkins for their invaluable behind-the-screens work for making FEST the success it was.